I’ve seen poster displays many times, in many places, but it never really struck me that not only are they are a very effective method of sharing knowledge, they also support staff engagement. Poster displays as part of Kaizen and Continuous Improvement processes in places like Ricoh Telford and the IdeasUK annual conference have always attracted me, but I’ve not seen them very much in Public Services. This week I was fortunate to attend an event at Abertawe Bro Morgannwg University Health Board (ABMU). 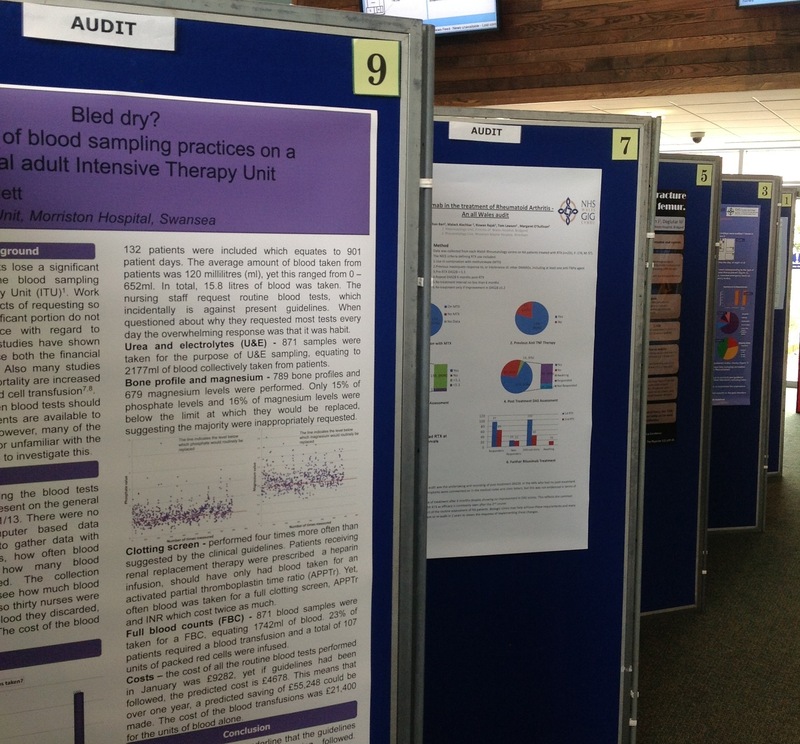 This was the annual poster competition which is the culmination of a year of looking at; Clinical Audit, Research and Quality Innovation Productivity & Prevention (QIPP). I was hugely impressed with the experience and think there are a number of benefits of using a poster approach, that others could use. Here are my top 5 tips. If you want to understand something, teach it. This is an old adage but very relevant to posters. Producing a poster will involve the translation and distillation of a mass of complicated data, information and knowledge. That thinking process has got to help with your own understanding of the material. Ultimately you want others to learn from you; you need to understand it to explain it. Graphics and short interesting text beats 10,000 words. Sorry, a statement of the bleedin’ obvious. Communicating using graphics and clear, concise text should get more people engaged and help them understand. It’s probably no coincidence we have advertising posters, not advertising essays. You reach further. You could look upon posters as the Grandparents of info-graphics, which flood the Internet. The point is you can literally print 100’s of copies of a poster and ‘post’ it to people. Alternatively, you can take a picture and tweet, Instagram or stick it in a blog. Potentially a massive reach for low cost with high impact. It’s good for Team learning. You could look at poster production as a post project learning exercise. Reflecting upon what you have done, recognising the achievements alongside, ‘what could we have done better’ can be part of the poster production. This might generate more open discussion and embed learning more deeply than a ‘head to head’ meeting to discuss what went wrong/right on this project? Other people will love you. External recognition of the good work you have done, particularly from peers, is pretty good. Posters can help that, even better if they are part of a recognition scheme like a competition. After the event I managed to speak with one of the organisers, Dr Sharon Evans. Here is a link to some audio of our conversation, with Sharon taking about why she thinks posters are useful and important. If you listen carefully, just at the end you might hear a reference to ‘made in Bridgend and used across Wales, and wider’. It sort of proves that point about posters having a far-ranging reach. One final though. I have previously posted about ‘Why is good practice such a bad traveler?’. I think that the poster approach could be a method of overcoming some of the barriers to good practice travelling that I mentioned. 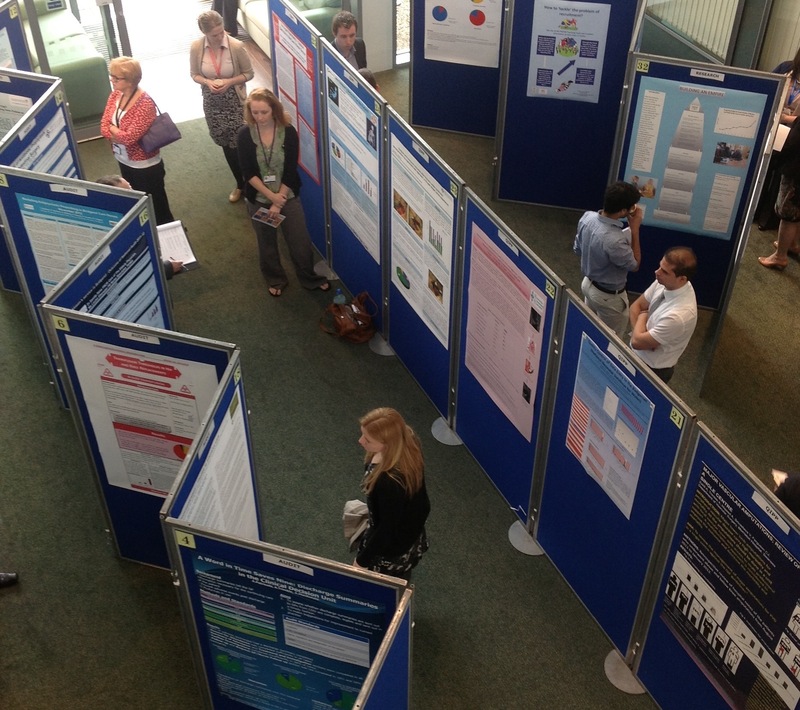 Posters are an effective way of supporting knowledge exchange. Posters can also support employee engagement through the process of making the poster, peer recognition and possibly external reward. There is opportunity to use the poster approach much more widely. Poster 9 of 46 in the competition. This is a very useful link. I have had a look. It’s astonishing how much information people are able to get across in 3mins (180 seconds). If anyone is planning to view the content, when you follow the link you will need to put in an email address and name to register your details with The Kings Fund, quite painless. Knowing that posters can help people understand more of the world around them, I find your article very interesting especially when you said that having posters can help achieve a “potentially massive reach for low cost with high impact.” If I were to have an ad poster made, I would know that it should be protected from the elements so that its message wouldn’t be faded or washed away by time. I will find a supplier for a place to put said posters in so as to not only protect them but can also help people gravitate towards the posters at the same time.